With "The Imaginarium of Doctor Parnassus," director Terry Gilliam makes the sort of the picture he's been pumping out since 1998: borderline unendurable. Coming off his career-torching work with 2006's "Tideland," it's comforting to observe "Parnassus" assume a less abrasive attitude when it comes to specifying the pageantry of the subconscious. However, that doesn't mean Gilliam has dropped his defenses. "Parnassus" remains steadfastly tedious, noisy, and incomprehensible, only cushioned from total disaster by Gilliam's sporadically comforting visual fetishes. An immortal man who long ago tangled with the Devil (an aptly cast Tom Waits) and lost, Doctor Parnassus (Christopher Plummer) is stuck with his traveling theater troupe, brought to life by trusted advisor Percy (Verne Troyer), performer Anton (Andrew Garfield), and his daughter Valentina (Lily Cole). Rolling across London, trying to entice the locals to pass through a magical mirror that permits access to the vastness of pure imagination, Parnassus finds special inspiration in the form of suicidal amnesiac Tony (Heath Ledger), who joins the show, quickly becoming its most prized member. When the Devil returns to collect on past debts, Parnassus fights to retain his force of goodness, while Tony finds fresh perspective on the other side of the mirror, where his appearance is altered (portrayed by Johnny Depp, Jude Law, and Colin Farrell), encouraging him to avoid the trouble he's created in the real world. Terry Gilliam has a way of cinematic repetition that either brings about staunch support or undeniable fatigue. It's been uncomfortable watching Gilliam bury his gifts in odious, shock value material over the last decade, reveling in toxic whimsy to suit his obsession as an iconoclastic filmmaker with loveable puckish habits. Gilliam is a mad genius, there's no doubt about that, but his taste in material has decimated his ability to properly modulate the purging of his subconscious, with "Tideland" a loathsome act of directorial suicide. I never thought I see him direct again. "Parnassus" isn't a return to form for Gilliam, but it represents a distinct pathway back to his former jovial self. A fantasy of the mind, the picture is a free-for-all odyssey of life and death, God and the Devil, real and unreal. It plays directly to Gilliam's tastes in cinema, and the affection for such grungy, cartwheeling interdimensional leaping is palpable throughout the entire film -- a sort of vague, depressive spin on "Time Bandits," only lacking Gilliam's impulsive youthful exuberance. Deploying his extravagant style of animation (summoned to life through creative, Pythonesque CG design), Gilliam brings an uneven balance of fantasy and encrusted reality. It's a revolving door of tonality he's loved since he picked up a camera, but the years and studio beatdowns have bent his antenna. Gilliam has turned to chaos to solve his problems, and with material as undisciplined as "Parnassus," the noisy approach doesn't do him any favors. The screenplay for "Parnassus" is epic, cheeky, and informed with a tattered Eastern religion fixation that plays into sequences of spiritual awakening and concepts of reincarnation. 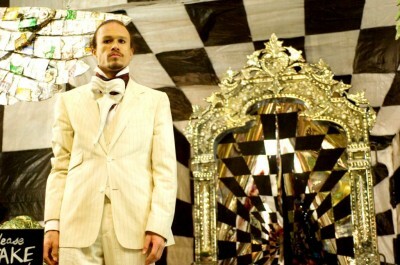 From the outside, it's a simple tale of the Devil and Parnassus gambling with the souls of humanity, but the moment the director begins to dig into the innards of the piece, "Parnassus" loses its focus, or perhaps lucid direction was impossible once Heath Ledger passed away during production. His absence is rather cleverly concealed by Depp, Law, and Farrell, who try to keep the spirit of Tony alive during surreal sequences inside the mirror-world. The facial change conceit is an obvious band-aid, but the cast does an affectionate job covering for the fallen star. However, the loss seems to muck with Gilliam's dramatic gears, and he relies on a rather strident, argumentative tone to flesh out his world, making for an uncomfortable, one-note pitch of tension. Perhaps Ledger's death tore the heart right out of the film, or maybe Gilliam just can't quit his addiction to discomfort. Though it promises something fanciful at times, "Parnassus" can be disappointingly moody. Overall, it's emotionally unavailable. Gilliam packs much into "Parnassus," steering the tale into a few baffling directions that alienate more than marvel, encouraging an overworked cast to further detach from their humanity to service the filmmaker's flourishes. I'm trying to cling to the positive here and praise Terry Gilliam for shedding his vile "Tideland" skin, pushing himself outside of his comfort zone and into a plot that encourages a sense of romanticism. Ultimately, Gilliam's itches overwhelm his aspirations, and while "The Imaginarium of Doctor Parnassus" has a few inspired moments of visual enchantment, it's bloodless creation, rigidly conforming to Gilliam standards I keep waiting for him to relax. His clenched career deserves a vacation. 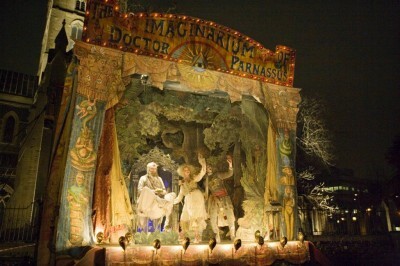 Buy tickets to "The Imaginarium of Doctor Parnassus" now!